This is a condensed public version of the Taking Stock in Pfizer (PFE) stock analysis made available via subscription to SAML subscribers. The full analysis, in PDF form with all accompanying data, can be purchased by readers at the bottom of this post. This segment contains an introductory discussion of Pfizer’s strategic dilemma in handling critical mass and what readers can identify as important fundamental themes during the stock analysis. Pfizer is a global research based pharmaceutical company with a long corporate history dating back to 1849. The company strives to demonstrate that their products effectively prevent and treat targeted diseases, improve symptoms and suffering and that the company helps to form the basis for improvements in the healthcare system. In 2007 management began focusing on lowering their cost structure by reducing the number of employees across the company by 11,000. The company repurchased $10B in common stock for cancellation and began to aggressively push Phase II compounds into Phase III trials. The majority of Pfizer’s current revenues are driven by a large group of established patent-protected medicines that in recent years have come under threat from lawsuits, patent expiration and generic competition. Lipitor, their flagship product, competes in a very competitive statin market (cholesterol lowering) and will lose its patent protection in November of 2011 when Ranbaxy is allowed to a sell generic version of the drug for a six month period. I want to provide readers with some background education on drug trials and clinical development in order for you to be able to put into perspective what Pfizer is currently doing and how successful they may/may not be with their ambitious plans. There are a few key concepts I want to present first for each reader to keep in mind when analyzing any pharmaceutical company. The most important fact to be aware of is that every drug has a commercial lifecycle. A drug is born in the lab and progresses through clinical trials after which regulatory approval is required to sell to the public. A drug grows through exclusive marketing rights provided to a company and years later its’ patent protection expires where generic competition erodes revenues and margins. Clinical trials compose nearly 60% of total development costs in today’s market and the capital required for funding these programs has accelerated significantly over the past two decades. A new drug is developed through a series of trials where the objective is to assess the safety of the compound in an environment of very high scientific standards. Through the entire process there is a massive amount of red tape that a company must go through in preclinical testing to advance the drug to clinical testing. Even once a drug makes it to a clinical phase there are numerous review boards and ethics committees who evaluate the danger to participants, the ability to obtain informed consent, methodology of the trial design and strict monitoring of participants for adverse side effects. In this first phase an investigational drug is administered for the first time to humans after successful trials on animals. This clinical trial is focused on the safety and tolerability instead of the effectiveness of the drug and determines the pharmacokinetics (what the body does to the drug) and pharmacodynamics (what a drug does to the body) in a small randomized population. Investigators assess each participant’s response to the drug, absorption within the body, length of availability in the blood stream and what dosage levels are considered safe and well tolerated. In the second phase the focus of the trial is to determine the effectiveness of drug in treating an illness or identified medical condition. Data on the safety, side effects and potential risks is collected and researchers work to determine the most effective dosages (tablet, extended release, controlled release, infusion, injection). This trial involves a larger number of participants; this time with participants who have the medical condition that the drug is intended to treat. This is the first stage where a placebo is introduced to determine environmental effect of the trial on participants. The third clinical trial focuses on testing a larger population. This trial is randomized and has a double-blind approach where neither researchers nor participants know if they’re taking the drug or placebo until after the trial ends. This trial is considered long-term since participants are involved from six to twenty four months. Researchers take a more geographical approach by taking participants in different environments to further test the impact of the drug. Before a drug can move on to the final clinical trial phase an application needs to be filed with the regulatory health authority. In the US a new drug application (NDA) is filed with the Food and Drug Administration (FDA). A description of the manufacturing process of the drug along with all collected data and results from the previous clinical trials must be provided to the FDA so they are able to determine the safety and effectiveness of the new medicine. If approval is granted, the new medicine can then be sold for use by patients. Only 20% of drugs entering phase one clinical trials ever make it to the registration phase. The final clinical trial is conducted after the regulatory approval of the drug has been received and is available for sale to patients. This final trial is where researchers collect additional information about long-term side effects, health risks or alternative benefits for other uses and continue for a number of years. This prized segment contains a strategic analysis of Pfizer’s internal strengths, weaknesses, opportunities and threats as well as external political, economic, social and technological challenges. Assessing management through a period of stagnating performance or restructuring is always a difficult task because choosing a set of effective evaluation criteria for the challenges facing a corporation are never easy to quantify. It is easy for a CEO or strategic stakeholder to announce cost cutting initiatives, that they are actively pursuing a change in the corporate culture or where the company expects to be. But a corporation will always encounter problems in its operations and these will need to be met swiftly and decisively with management keenly aware of emerging problems before they become public knowledge. When evaluating management through a restructuring period an investor needs to remind him/herself that financial performance will only be visible once the restructuring is completed and the company finds itself on the other side. An investor can choose to invest in a company now or wait for a period of time to see if changes being made will effectively benefit the corporation over the long-term. My number one priority, when assessing any management structure, is to answer the following question: Does management have their fingers on the pulse of the business? Management needs to focus on achieving meaningful leadership within their organization. Achieving results on their own will not be enough to save a corporation and secure the long-term viability of a business; management needs to achieve results through others. In a top-down approach management needs to have the ability to empower employees, make strategic decisions that fit the business model and focus on profitability while continuing to operate the business effectively. When current CEO Jeff Kindler joined Pfizer in 2002 the company was suffering from corporate obesity and critical mass. Jeff Kindler has a background in law (Harvard Law School) and comes from a strong operational background as Vice President at both General Electric (GE) and McDonald’s (MCD) before he became CEO of Pfizer in July of 2006. The fact that he was chosen as CEO over more tenured management within Pfizer signalled, in my opinion, the Board of Directors understanding of the level of importance for the corporate leader to understand patent and legal issues facing the company and the need for a fresh perspective on the future of the business. Pfizer’s veteran management team has an average 18 years of experience within the company with many having a solid education and work experience in the medical field. Under normal circumstances experience of this level within the management ranks would provide soothing comfort to a prospective investor. In my assessments of Russel Metals (RUS) and Manulife Financial I highlighted the need for senior management in predictable and stable businesses. In a sector such as healthcare that requires a commitment to innovation, achievement and fresh perspectives to maintain a competitive edge in a rapidly changing industry an average of eighteen years means the company has a lot of experience and wrinkles. The pharmaceuticals industry is changing, sometimes with drastic movements, and investors need only to look to a competitive analysis to determine the lagging performance of many within the group. Reshaping the top 100 leaders of the business to reflect a balance between new and veteran leadership is an admirable goal. But when I assess the senior management of the company and look for innovative leadership or individual who can think outside the established framework to influence the corporate culture of Pfizer I don’t find what I would expect to see. A serious concern I have with the extent of cost cutting and job losses at Pfizer is the preservation of the corporate culture. When you look back ten years Pfizer was a company that thrived on the successful development of many important compounds found in the drugs they develop and market today. Their productivity within their R&D divisions was unrivalled amongst their peers, but as the company grew through acquisitions and attempted to integrate multiple corporate cultures into their own a number of key resources were lost that were vital to the success the company had enjoyed for so long. Redefining and motivating any corporate culture devastated by job losses, cut backs and significant change is not an easy task and each has a direct effect on the productivity of employees in executing the objectives of the company. Many of the leaders within the company were present during the ugly integrations of previous mergers and the end result, in my view, will continue to be the same without a dramatic shakeup. No employee can work productively with multiple managers and repetitive oversight of their tasks and the ratio of employees to managers in recent years at Pfizer has swelled at the bottom to as high as 13:1. This segment contains a discussion of Pfizer’s competitive environment, forecasted industry market share/growth for 2009, market conditions and list of direct competitors with disclosure of what I own in the healthcare industry. Pfizer has been in a restructuring phase for a few years now and decided to refocus its product portfolio prior to its Wyeth acquisition. Pfizer’s new focus will target therapies for Alzheimer’s, Diabetes, Inflammation/Immunology, Oncology, Pain, Psychosis, Asthma/Chronic Obstructive Pulmonary Disease (COPD), Genitourinary, Infectious Disease and Ophthalmology. 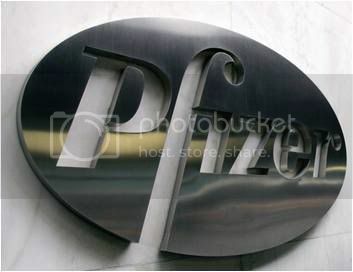 Pfizer is exiting drugs and shelving R&D on new compounds for Anemia, Atherosclerosis/Hyperlipidemia, Bone Health/Frailty, Gastrointestinal, Heart Failure, Liver Fibrosis, Muscle, Obesity, Osteoarthritis and Peripheral Artery Disease. The exit from atherosclerosis/hyperlipidemia is surprising considering Pfizer’s dominant position in that market with Lipitor and demonstrates the perceived lack of profitability present. When Lipitor comes off patent Pfizer is expecting a significant decrease in sales of the drug and likely with the exit of professionals who worked on the Lipitor project from the company the intellectual gap was significant enough to warrant exiting that area of expertise. Additionally statins are a group of drugs that are expensive to manufacture and profit margins may be too slim in a generic environment for the company to see any viable reason to remain in the market. Pfizer has also concentrated on selling non-core assets as best as it can with the sale of its consumer health division to Johnson & Johnson in 2006. The failure and subsequent abandonment of Exubera is disappointing for the company as Exubera was the first inhaled insulin therapy for the treatment of diabetes developed. Despite launching in Germany, Ireland, the UK and US in 2006 the financial performance of the drug accompanied with the lack of adoption by patients and physicians led to an exit strategy for the drug. The fact that Pfizer was unable to sell the drug and technology to larger diabetes drug companies such as Novo Nordisk was another strategic opportunity missed by the company to recoup some of the costs in developing the drug and delivery technology. Pre-tax charges amounted to over $2.8 billion in 2007 at a cost of 5.8% of total 2007 revenue. Pfizer’s did attain achievements in 2008 of advancing 14 drugs to Phase 3**. The company currently has a target of placing 24-28 drugs in Phase 3 by end of 2009 and submitting 15-20 drugs by 2010-2012 for approval. ** On February 24th Pfizer announced it was discontinuing development of two Phase 3 compounds, esreboxetine for fibromyalgia & PD 332,334 for generalized anxiety disorder (GAD), due to “current market dynamics” and due to the consideration of it being “unlikely that either compound would provide meaningful benefit to patients beyond the current standard of care.” Although neither drug was abandoned due to safety reasons of patients this is yet another setback in the R&D department for Pfizer. Discontinuing compounds this late in Phase 3 is not as common as earlier withdrawals, but likely competitive and cost factors led to the decision to scrap their further development. Global Approvals of Fesoterodine (US), Maraviroc (Japan), Macugen (Japan), Rifabutin (Japan), Sutent (Japan), Champix (Japan), Genotropin (Japan), Zithromax SR Peds (US), Sutent (Japan) and Revatio (Japan). Global Submissions of Fablyn (Europe), Lyrica (Japan), Xalacom (Japan), Maraviroc (Japan), Maraviroc (US), Lyrica (Europe), Revatio (US and Europe), Geodon (US), Geodon Peds (US and Europe), Norvasc (Japan), Lyrica (Europe) and Zithromax SR (Japan). (Data dating to 1991 available with purchase of full analysis or to SAML subscribers). One important habit for an investor to get into is not to focus too exclusively on historical data. While I use historical data to reveal important trends, fundamentals and a fair market valuation of a company I constantly remain conscious of current operations, the strategic focus of management and how a number of other factors will contribute to its future success. When you examine the historical numbers of Pfizer there’s not a lot that makes an investor enthusiastic about its future prospects. The dividend grew at a substantial rate for over 40 years but has now been cut in half and growth in profitability has stalled dramatically. The future loss of revenue from Lipitor will dramatically affect the business and despite commitment to new drug development the company has performed poorly on executing and achieving strong results with its R&D spending. Revenue growth has outpaced expense growth over the past five years and that is positive, but revenue growth over the past five years has been anemic at 1.8%. The company has established an impressive history of return on equity (ROE), but their return on investment (ROI) related to research and development costs have been abysmal bringing into question management’s ability to achieve results in this key department. Despite lowering SGAE (as % of net sales) from a historical average of 37% to ~32% the bottom line hasn’t adjusted sufficiently indicating other fixed costs are dragging down profitability and heavy job cuts are only a short-term solution. Book value growth per share (BVPS) has averaged only 3.3% over the past five years versus a historical average around 8%. In real terms (after inflation) management has likely returned zero book value growth which is not something that I regard as positive as a value investor. Pfizer relies on its pharmaceutical division for over 90% of revenues. Their animal health division has continuously generated 4-6% of revenues which amounts to a questionable benefit to the company’s operations and with no growth in revenue this division should be a candidate for a non-core asset sale. Pfizer had an excellent history of dividend growth with a historical average of over 18% per year before cutting it by 50% in 2009 to $0.64 per share on an annual basis. This likely won’t be forgotten by investors seeking a stable yielding investment and future dividend growth will be tempered at 5-6% annually as the company looks to tackle new debts taken on through the Wyeth acquisition. At some point the company must tackle the massive amount of goodwill sitting on their balance sheet that stands at 21% of their market capitalization at the end of 2008. Compare that to Coca-Cola (KO), owner of the most valuable brand globally, with goodwill of 4% of market capitalization and the premium offered to Wyeth shareholders in order to purchase the company will only further compound this serious obstacle for Pfizer. This segment contains access to a dedicated online discount cashflow calculator (DCF), historical numeric summary, current financial data and DCF valuation with target price. This segment contains a discussion of Pfizer’s recent purchase of Wyeth (WYE) including identified synergies and conflicts, an update on Pfizer’s current restructuring, a discussion of influences to corporate culture and future investing prospects of the two combined companies. Disclosure: I own shares of Coca-Cola (KO), Russel Metals (RUS), Manulife Financial (MFC), Johnson & Johnson (JNJ) and structured senior debt of General Electric (GE) at the time of this post. Craving more? Visit the TMWTFS Stock Analysis & Reviews page for a full list of analyzed stocks and comments written by my peers. GREAT analysis. While I probably won’t be buying PFE, working through your analysis has helped me a lot. Thanks, Brad. Great anaylsis. The question is whether PFE is systemic of the entire industry or an exception? Susan – I'm glad that the analysis helped and I won't be buying PFE either any time soon. The purpose of the analysis is to provide an unbiased & objective view of a company from a fundamental perspective and evaluate its investment potential rather than a simple, "buy/sell this stock for this reason". TMW – I don't think PFE is representative of the entire industry, but it does provide a number of important lessons for investors to consider about the industry. We're seeing consolidation currently (today's Merck & Schering announcement), but these should strategically enhance a company rather than form out of perceived necessity. We're seeing the demise of many large companies due in part to their "critical mass" such as GM, GE, PFE, C, BAC. There comes a point when size doesn't scale in the operations you're targeting for growth and you have to re-evaluate your strategy to find the answers to simple problems. I am not even going to repeat myself so I am not going to say that I enjoyed your analysis a lot. It is definitely worth more than S&P or Value Line reports that charge investors much more for much less.. Despite this however, PFE is a "broken" dividend stock for me.. Maybe a decade from now PFE could find a way in my stock portfolio when it changes its business model to "creating" rather than "buying" drugs. Interesting discussion on the ‘critical mass’ of large blue chip’s and how this relates to the world of dividend growth investing. In ‘Investment Zoo’ Stephen Jarislowsky mentions companies like Pfizer and Philip Morris as companies investors can invest in for the long haul due to their command of their respective markets. As we’ve seen with Pfizer and to some extent GE (though that’s a different bag altogether) these companies can and do reach a point where they are almost too big and growth becomes forced rather than developed organically. Another great analysis, thanks Brad. Brad’s work is by far the most in-dept analysis I have found from DYI over the blog sphere. The complete view of the business is the most important part for me as a beginner in DYI.